Oh the doldrums of Winter. Christmas and it's glow have passed, and the grey and the dark have set in for the long haul. I hope that my winter will be broken up with some time in Cornwall where the grey moodiness fits the landscape and makes one feel in tune with the season rather than oppressed by it. In January and February the best thing to do is hunker down and make something fills you up, grounds you and gives you lots of energy. Anything that also warms up your house with lots of steam is a bonus. The other night my company had a new year's celebratory dinner at the Hoxton, a pretty amazing steak house. In addition to lots of other love cuts, there were a half dozen T-bone steaks. Being a broth aficionado, I gave the waiter a good laugh by asking for the bones to be wrapped up, and walked out dreaming of this soup. 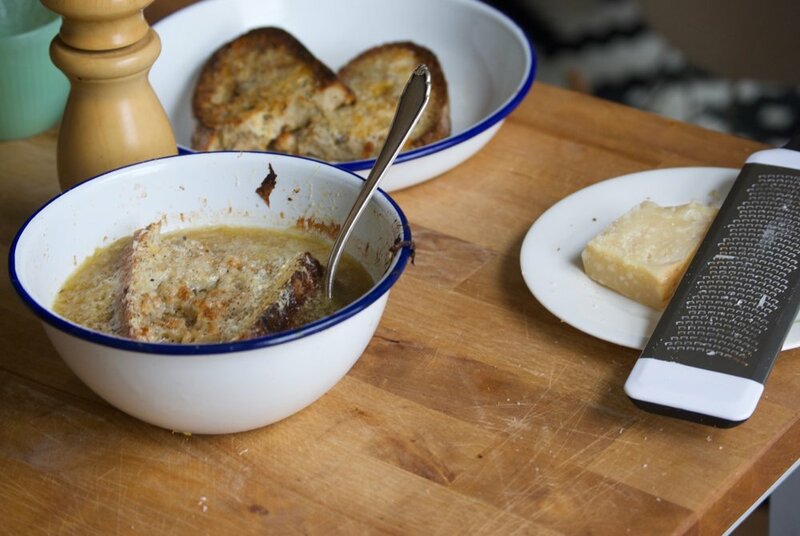 French Onion Soup is incredible because it's basically just two ingredients; beef stock and lots and lots of onions. From there, it's just time and patience. A few things about the beef stock that make a big difference; boil the bones just by themselves for 10 minutes. You'll see grey scum rise to the top, scrape this off a few times until it stops rising, then you can add the vegetables and herbs. 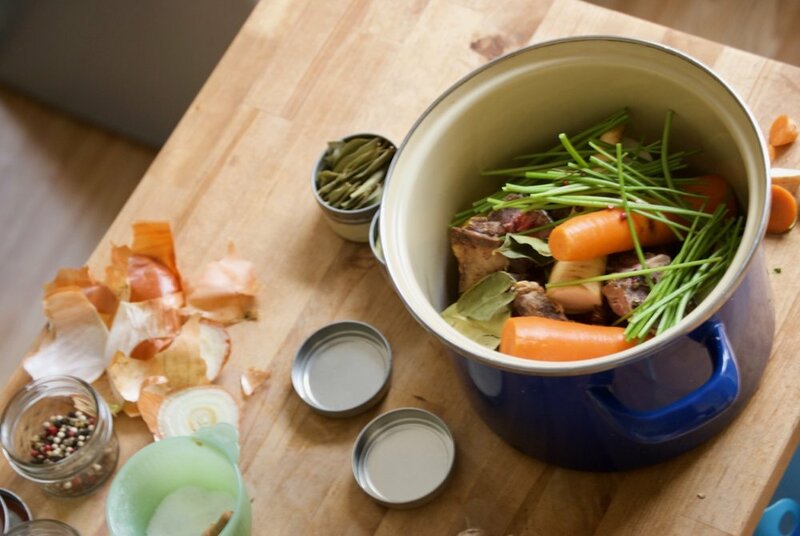 It's best to make the stock the day before and simmer it for at least 8 hours. The longer you simmer the stock, the deeper and more flavorful it becomes. 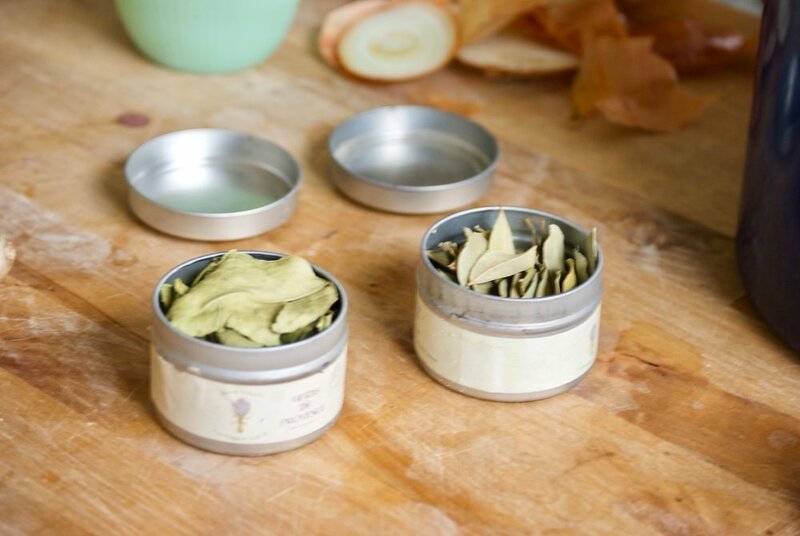 It's a good idea to store the stock in the fridge overnight so you can scrape the layer of fat off the top. You can cook the onions down at the same time the stock simmers. From the start keep the onions on low heat, and give them a stir every 30 minutes or so. When the onions start to caramelize you can add a just a drop of water to the bottom of the pan, which will help scrape up the gorgeous dark "frond" that starts to form on the bottom. I realize that this doesn't have that gooey layer of Gruyere that makes French Onion soup so famous. I have to pick and choose when and which kind of diary I eat, so I decided to use a soft powder of parmesan cheese on my sage and coriander sourdough. 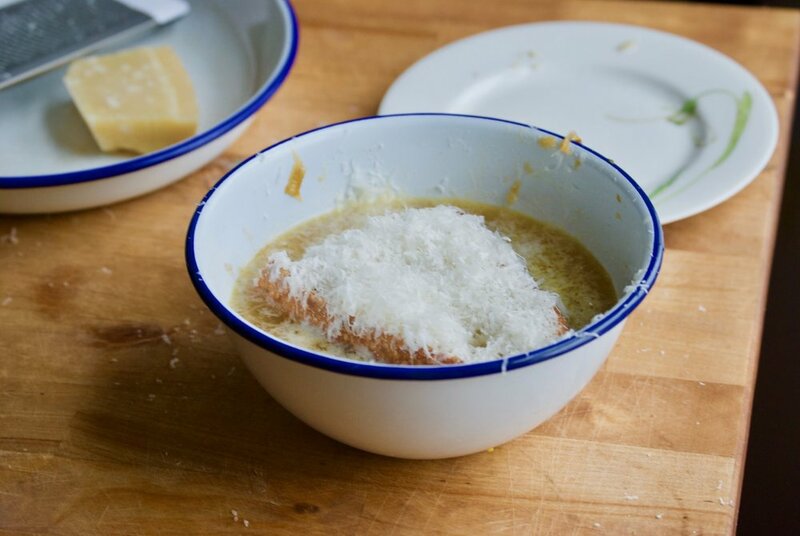 I toasted the bread a bit first, ladeled in the soup, floated the bread and covered it all with a heavy dusting of the cheese. 5 minutes under a hot broiler, ét voila! 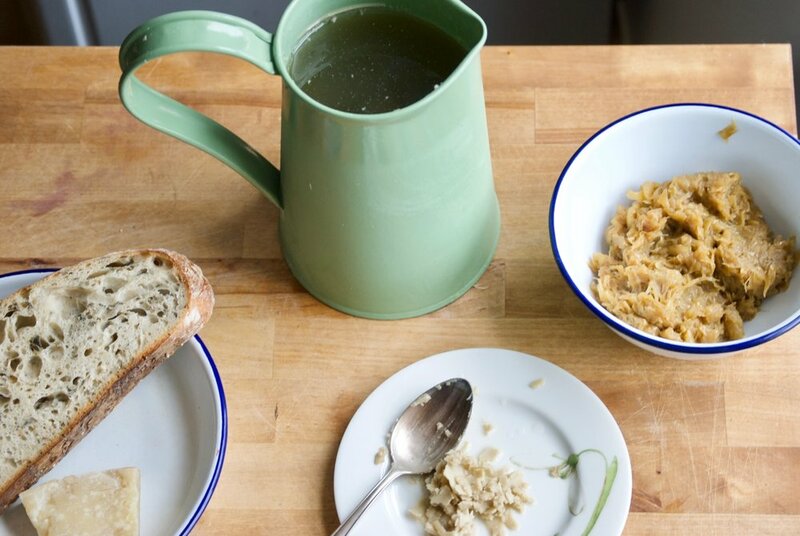 La soupe l'oignon! Oo la la. Put bones in the pot and cover with water, and add two spoons of salt. Bring to a boil and skim off the grey scrum that rises to the top. When it stops rising, add the vegetables. and turn down to a low simmer. Simmer covered for 8-10 hours. Turn off the heat and let the stock come to room temperature. Strain through a fine mesh sieve. Store in the fridge for a few hours, until the fat has solidified at the top. Scrape off with a spoon. While the stock is simmering, slice the onions. (I use a food processor with the slice blade.) Heat the oil and the butter slowly in a pan, and add the onions with a big pinch of salt. Keep on low and stir every 30 minutes. It will take 3-4 hours for the onions to cook down to a dense, golden brown. You can store the onions overnight. 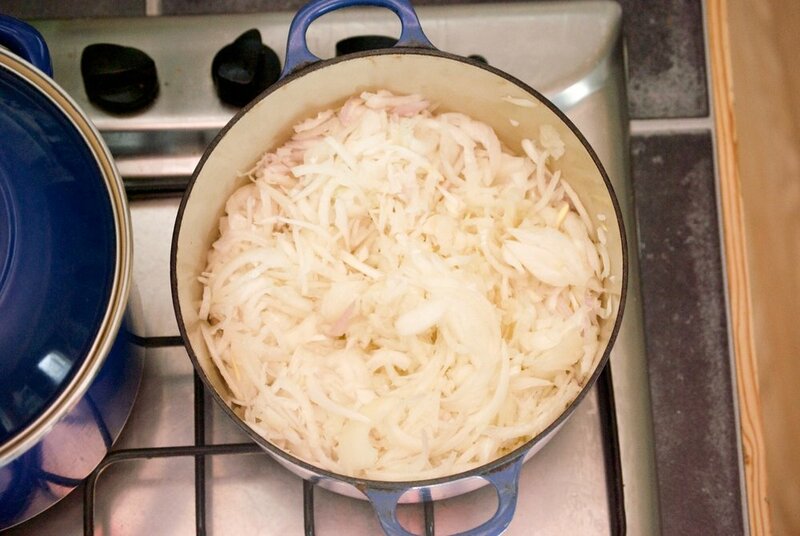 When ready to serve, heat the stock to a gentle simmer and add the onion, stir and heat through. Toast the bread, and rub with a garlic. 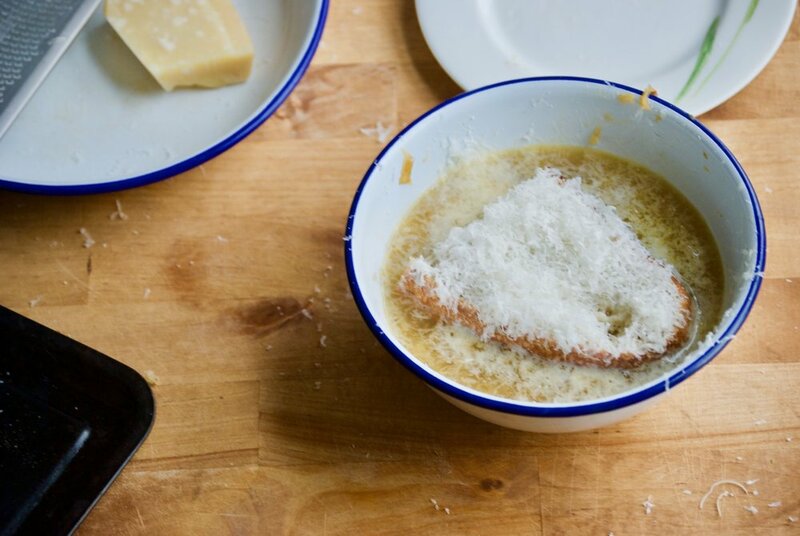 Float the bread in the soup, and sprinkle heavily with parmesan. Run under the broiler until the cheese is brown and crispy.